We know food we get on our plates doesn’t always look like what is presented on the menu – be it in a restaurant or an airline. 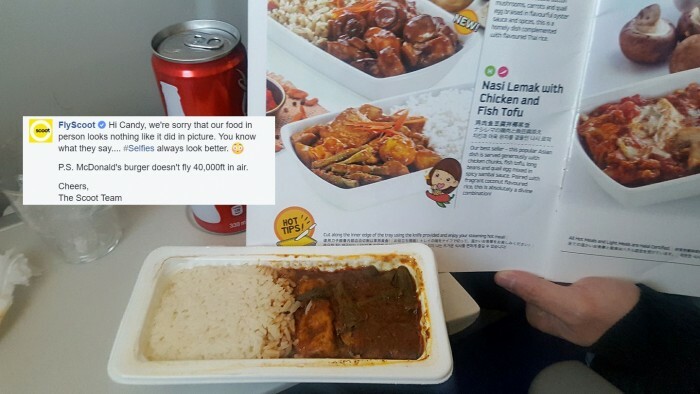 However, one flight passenger decided to voice her disappointment at Scoot’s Nasi Lemak with Chicken and Fish Tofu on Facebook which she ordered on board. 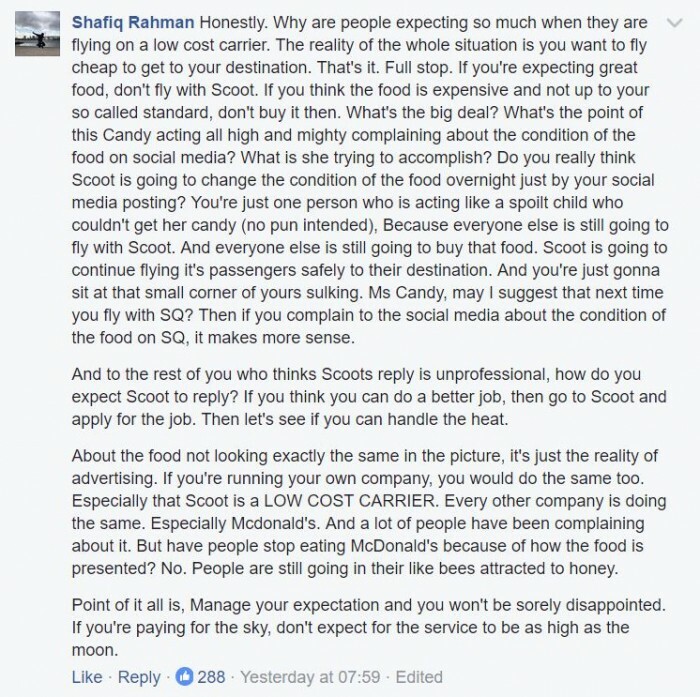 In response, the cheeky Scoot took a leaf out of Wendy’s Twitter page, and responded back with: “Selfies always look better” and a “McDonald’s burger doesn’t fly 40,000ft in air”. While the response would seem perfectly natural to those of us who understand the brand’s DNA and nature, several netizens called out the brand for being “unprofessional” in its response. This also led to many others defending the brand saying that there was nothing wrong with Scoot’s response. When it comes to threading the fine line between being witty and being seen in a negative light, Ritesh Sharma, social media strategist, Isobar Singapore, said that as a brand, Scoot has created a niche personality for itself, and that reflects in its communication – as a rebel, as a ‘different’ airline provider. “If you are posting something remotely controversial, try showing the posts to people in the office and ask for their opinion. Even if 20-30% people find it offensive, the brand should either drop the idea, or prepare a team of community managers to respond to all the comments. Preparing some replies beforehand would not hurt too,” Sharma added. What did you make of the comment? Share with us below. The Deliveroo tiles are cookies, meaning that players can literally crunch their ways through a delicious “fat choy”.. While Dove and other brands in Unilever portfolio have seen digital play a huge role in the media mix, Jopa Malantic, regional bra..